This cherished Golden Age classic is performed by our young stars, ages 6-16. Cinderella, a young woman who is over worked and under appreciated, to say the least, finds that with a little help from her Godmothers, she is capable of making the Impossible, Possible. These young performers will remind us all how hard work, gumption, and just a little bit of magic can lead toward a future that is just as we've imagined. 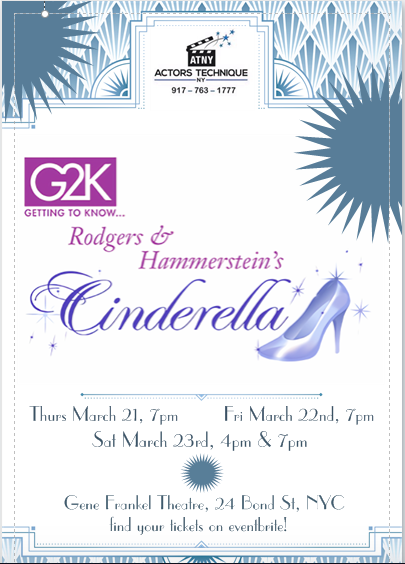 For an enchanted evening of musical theatre splendor, join ATNY for Cinderella at NYC's Gene Frankel Theatre on Bond Street. Limited availability, so buy your tickets now! Limit 4 tickets per show/per family. Children 3 and under are free if they can sit comfortably on a lap.